The Carolina West Sports Medicine 2005 Wildwater Team Trials will be held March 5th and 6th 2005 on the Nantahala River in Western North Carolina. The race is just 45 days away. Are you ready? The Carolina West Sports Medicine 2005 Wildwater Team Trials will be used to select the Senior USA Wildwater Team and half of the Junior USA Wildwater Team. Six boats will be selected per class (K1, K1W, C1 & C2) for the senior team and 2 boats per class for the juniors. The remaining junior positions will be contested at the West Coast Junior Team Trials, June 17-19 in Colorado. Team Trials will consist of two days of racing. Saturday March 5th will be the Sprint race. Competitors will do two sprint runs starting just above the class 3 Nantahala Falls and end about two minutes downstream at the old steel road bridge at the Nantahala Outdoor Center. The times from the two sprint runs will be combined for a result. Sunday March 6th there will be a classic or long race starting above Quarry Rapid five miles upstream of the sprint and finishing at the same old steel bridge. Competitors will only do one classic race. Your results from Saturdays and Sundays race will be combined to select the 2005 USA Wildwater Team. 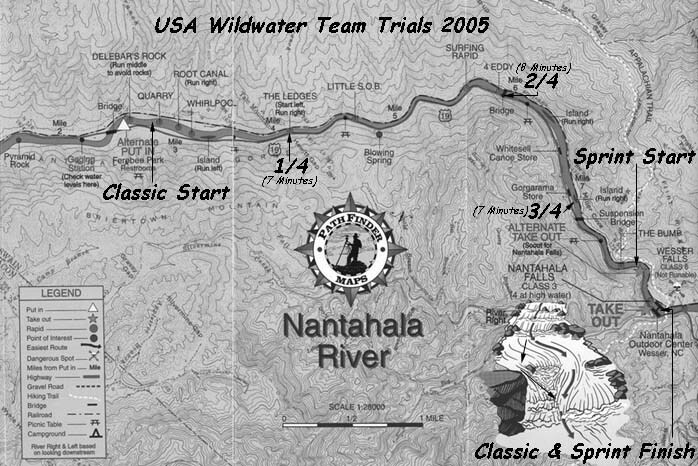 A river map of the race course can be found at www.usawildwater.com/races/Nantahala_Map_2.jpg. Seniors must meet minimum percentages off of the fastest boat at the race to be considered for a spot on the senior USA Wildwater Team. Complete details on minimum qualifying percentages are listed in the entry package. Download a Carolina West Sports Medicine 2005 Wildwater Team Trials entry package from www.usawildwater.com/races/05_Team_Trials.pdf. Send in your completed entry form before February 21st 2005 and save $5 off of the registration fee. You must be a US Citizen or meet USA Canoe & Kayaks regulations regarding team status. You must also be a member of USACK in good standing. To be considered for a team position, you must race in an ICF legal wildwater boat, Wavehopper or Fastwave. ICF boat regulations can be downloaded from www.canoeicf.com. Your boat must have airbags bow and stern and of sufficient volume to be considered legal. Check out the ICF Wildwater rules at www.canoeicf.com. Boats must meet ICF maximums for length, minimums for width and meet a minimum weight when the mandatory airbags are installed. There will be a boat inspection at Team Trials. ICF boat regulations can be downloaded from www.canoeicf.com. You must wear an ICF approved PFD. Coast Guard approval is also accepted. Your PFD will be tested at Team Trials. You must wear a helmet that the organizers consider "safe�. Your helmet will be scrutinized at Team Trials. It is your responsibility to become familiar with the ICF and USACK Wildwater Committee rules regarding race conduct, safety and minimum requirements. For details go towww.canoeicf.com for the International Canoe Federation. For USA Canoe & Kayak go to www.usack.org and for the USACK Wildwater Committee go to www.usawildwater.com.